2009 was my first year of bike commuting. I purchased a 2009 model year Raleigh One-Way in January, which arrived just after my birthday in February. Racks, lights, and various bags were subsequently purchased. Here are some of the things I tried and liked (and some things I didn’t like) in 2009. Brooks B-17 Saddle: Much has been written about the comfort of this saddle. I have to say, it doesn’t feel any more or less comfortable than my race saddle (a Specialized Toupe) when in a racing crouch, but it provides nice broad support when in a more upright position. The side skirts seem to be nicely finish and haven’t ripped up my pants. Pletscher Master Rack: This is a relatively inexpensive rack from Switzerland. It has a spring clip, little metal loops that fold up and down for holding things in place, and a light bracket at the rear for euro-style bolt on lights. The mounting system is a little clumsy. It looks more utilitarian than pretty, but it is very very functional. I have seen great racks that are three times the price (I think I got mine for $40), but with half the functionality. Cygo-Lite Dual-Cross Pro Li-On: These are the lights pictured above. So far, these have been great. They provide more than adequate light and I can use it for three or four days straight before I need to recharge the battery. The head unit is quite large, though, and the battery lead is short. Still, an excellent light. 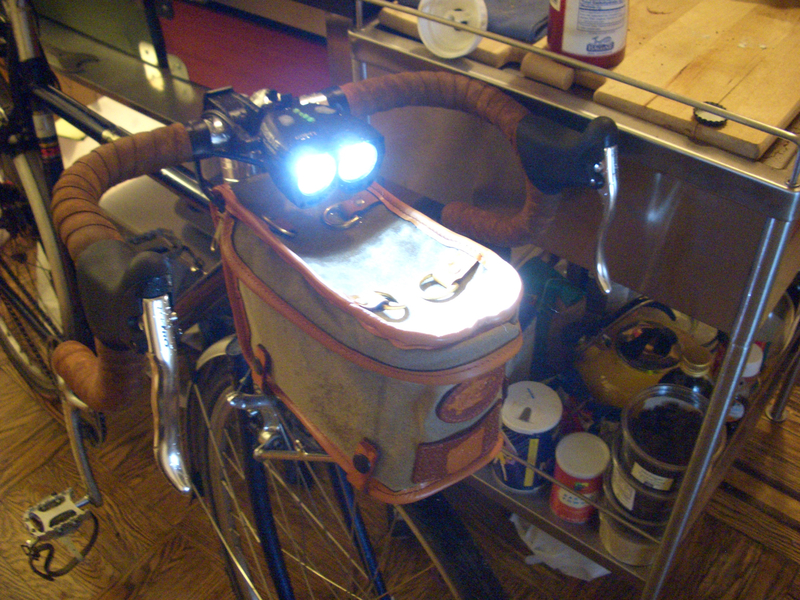 Nitto M-12 front rack and Nigel Smythe little loafer bag. This has so far been a great combo for quick errands when all I need is a place to stash gloves, a hat, and maybe my phone or wallet. I’ve even used it to carry home stuff from a quick grocery run (lotion, some broth, cheese, and an apple or two). The rack has never given me any problems, and the bag keeps my stuff dry. Plus, I think it looks sharp. Velo-Orange touring pedals and leathered toe clips: These are fantastic pedals. My shoes have only slipped when it’s been absurdly wet. The platform is wide and comfortable. The bearings seem smooth. Color me impressed! Leathered toe clips do indeed keep the toes of your nice shoes from getting scuffed up. Showers Pass Touring Jacket and Club Pants: These have kept me toasty dry in the worst of rains and toasty warm in bitterly cold winds. The jacket has pretty good venting that is easy to adjust and the pants are articulated so as not to restrict movement. The jacket arms are weirdly long, though. They are so long that I have to do up the velcro when not on the bike or they just fall over my hands.